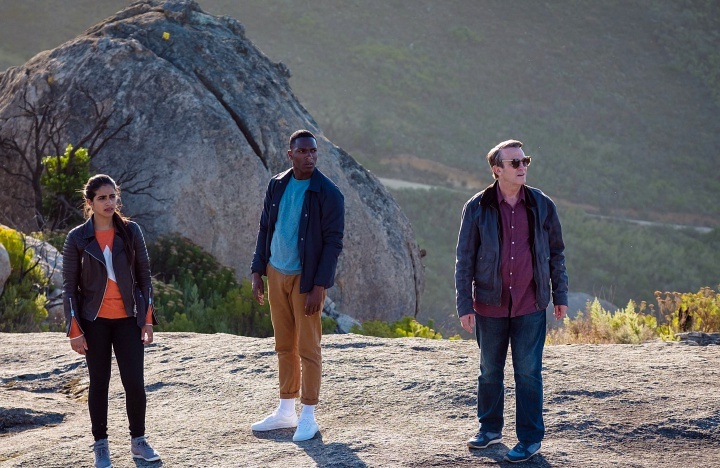 It’s part and parcel that Doctor Who does miraculously wrap up its storylines most weeks in ways that can feel too tidy; that as we enjoy the hours, an eyebrow or two might be raised. After all, this is at heart a series for children — and we are all children at heart — so we don’t terribly mind the sometimes silly or the not-always-logical, and we heartily laugh over those campy, old episodes. 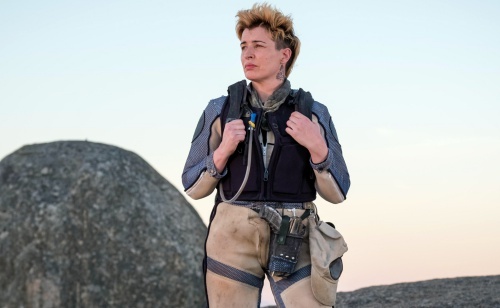 Thus, right at home with this second of Thirteen’s outings, first wondering exactly when Ryan would wake from what surely must be a crazy dream, we’re not entirely surprised that he never did, Still, “The Ghost Monument” was an hour well-spent, because these are truly wonderful actors and characters who can make us believe in the Doctor’s magic, and in her brilliant brain. Returning right where we left Thirteen and Companions floating in space, contemplating how the humanfolk could somehow survive, the scene quickly changes to Graham assuring a just-roused Ryan that they’re both alive, aboard a ship — “My spaceship” — asserts Angstrom (Susan Lynch), an alien who “scooped” the pair (“Only saw the two of you”) leaving the boys wondering where and how Yas and the Doctor might be. There’s no long wait to find their friends are on another ship, this one headed for Desolation (the planet, that is) and piloted by Angstrom’s competition, Epzo, in an elaborate intergalactic race. After a crash landing and to each traveler’s measured relief, the Companions find they’ve been implanted by an alien, yet again — this time, to keep them alive and able to communicate (auto-Google Translate, thank you very much). 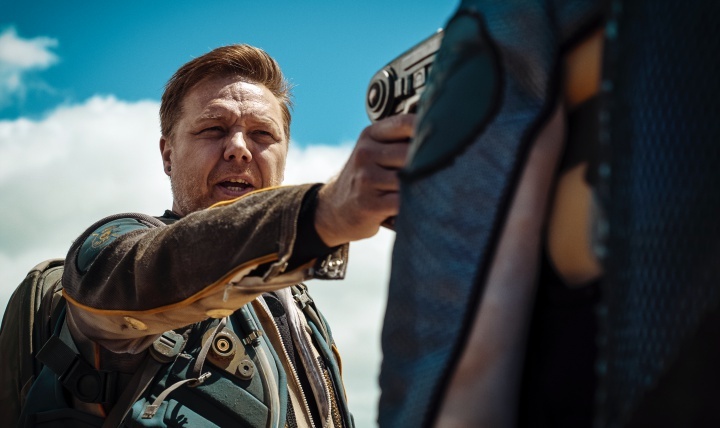 An alarm sounds, and with the flash of three suns (“Want to borrow my shades?”) and a hologrammed tent, Epzo and Angstrom’s competition — the Rally of the Twelve Galaxies — takes off … the Doctor noting that the planet they’re on “doesn’t make any sense”. Still, her Spidey-Sense has not failed the Doctor, for she quickly realizes Ilin’s (Art Malik) race to find the titular “Ghost Monument” (It appears in exactly the same place every thousand rotations) refers to her beloved T.A.R.D.I.S; “If we get to it when it phases in, I should be able to get us home”. What do the Remnants know about the Doctor? “We see deeper though, further back. The Timeless Child… we see what’s hidden, even from yourself. 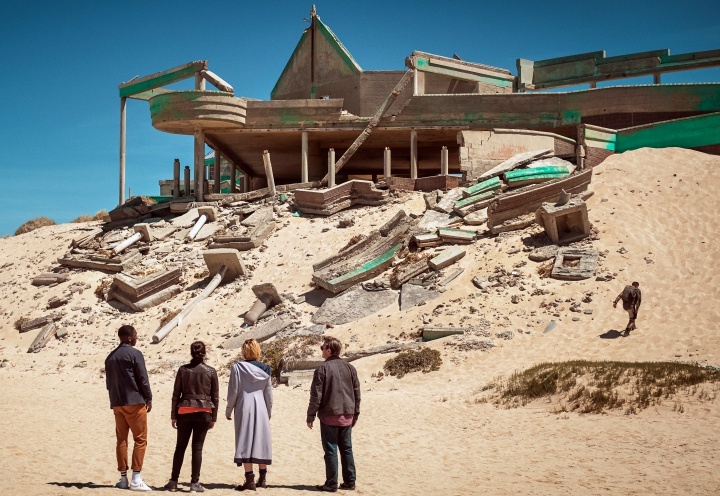 The outcast, abandoned and unknown…” Presumably, we’ll find out more about who the Timeless Child is over the course of Series 11. Ian Gelder (Game of Thrones [Kevan Lannister], Torchwood, Casualty) voiced the Remnants. Thirteen’s T.A.R.D.I.S. reunion was truly chill-inducing, and how about those redecorations?!! (I seriously need a biscuit dispenser in my vehicle.) The interior reminds me a bit of Battlestar Galactica‘s organic Cylon interiors (I’ll never forget when Starbuck rigged and piloted that Cylon Raider). You can hear all about the redesign in this extra segment. As per usual, some of the group’s predicaments were solved just a little too easily (and without requisite danger) — especially that lighting of the Acetylene fields to wipe out the Remnants. And as per usual, we’ll let it slide, inner grumbling intact. That race was about the simplest “final event”; the robots were handily disposed with a simple electromagnetic pulse; no one but the total jackass was hurt, and Ilin was quickly convinced to reverse his decision and declare joint winners. 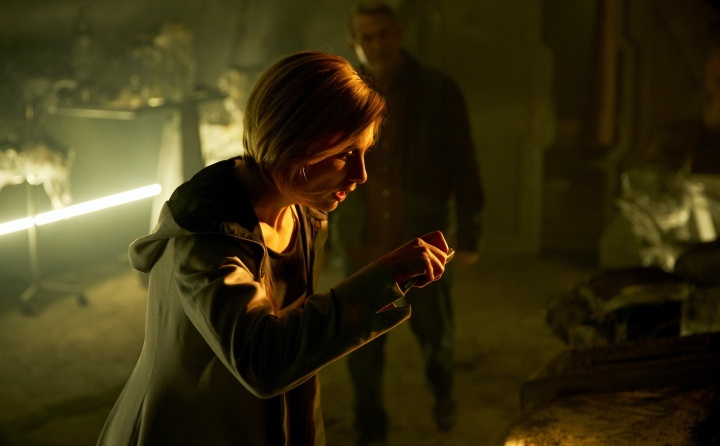 Thirteen refers to a “Venusian move”, alluding to Jon Pertwee’s Third Doctor, known for his Venusian Aikido mastery. The Stenza appear to be a new big bad, having already appeared in last week‘s episode, and now known to be behind Alberia’s (Angstrom’s home planet) cleansing, and the desolation of Desolation’s enslaved scientists’ planet. Ryan, though — disregarding the Doctor is going to get you in trouble, buddy. Though his video-game-like aggression was a moment of understandable adrenaline, I hope there’s no telegraphing his death, here. I mean, the Doctor is asked about the T.A.R.D.I.S. : “You expect us all to fit inside?” and doesn’t respond with an obligatory “It’s bigger …” ? Not sure how I feel about this. The Doctor says she nabbed her sunnies from either Audrey Hepburn or Pythagoras — but she pulled them from the pocket of the new coat she only just got? In next week’s preview, the group meets Rosa Parks — how cool is that? (Are we gonna die?) One day, yes; happens to us all. Welcome to what I presume is your first alien planet. (What’s that?) It’s a tent. Will people and things stop putting things inside me? So, we’re sticking with Graham then, not Grandad? Right now she’d be saying, what’s the matter with you, we’re on another planet, how cool is that? Were you born that miserable, or did you have to work at it? (Can’t outthink bullets.) Been doing it all my life. I love you, I’ve missed you. You’ve done yourself up. Very nice. (It’s a spaceship. And a time ship.) This is proper awesome.